Wednesday Night's IB City Council's Split Vote to Amend Ordinance for Special Event Permits Disappointing for Many Residents, Businesses and City Workers! IB City Council's Split Vote Night to Amend Ordnance for Special Event Permits Disappointing for Many Residents, Businesses and City Workers! 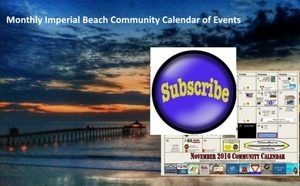 The Large Number of Special Events Happening in Imperial Beach Has Become a Big Problem for Many IB Residents, Businesses, and City Workers. Wednesday's 2 - 2 City Council Vote Didn't Help the Situation but Item is to be Revisited at Next City Council Meeting. With Mayor Pro Tem Lorie Bragg leading Wednesday nights Imperial Beach City Council Meeting with IB Mayor Serge Dedina out of town it was business as usual and everything ran smoothly most of the night. However, things got interesting when City Manager Andy Hall spoke on Agenda Item 3.1 which called for a simple ordence change which would have changed Imperial Beach's requirements to get a Special Events Permit down to 25 from 50 and bring it in line with that of other local beach cities. City Manager Hall also talked about the many complaints the City was getting from a large number of residents and local merchants about the large number of Special Events going on in the city and the strain it was putting on city workers and the city's budget as they have to do lots of work in preparation of the events and clean up afterwards not to mention the damage that occurs to city property because of these events. Hall also said that they were causing complaints from residents about noise and parking plus the large number of events at city parks, 220 in the last year with 178 permits for noise amplification, gave residents little time to enjoy the city parks for themselves. Hall said that many of these events were causing businesses to complain about losing business as people shopped at booths at the events instead of visiting the merchants businesses who pay for the privilege of their location to attract shoppers. Hall also spoke that something that should be considered was limiting any entity to 4 Special Events per year but before a vote could be even take and some discussion back and forth between the council members in attendance, Lorie Bragg, Bobby Patton, Ed Spriggs and Mark West, Bobby Patton move to table the request until there was more discussion and possibly a committee or more research done on the situation. That request was quickly seconded by city council member Mark West who said he would prefer to wait until Mayor Dedina was back before making any decision and wanted more information. Some of the things Hall brought up as possible solutions included larger deposits, larger fees, limiting the number events allowed so some weekends there would be no Special Events at the beach. On all of these the solution lacked data or information which would make it hard yo make an informed decision so in a lot of ways in made sense ro handle it at a later time when some of these solutions could be made with more information available to the City Council. Although Patton's motion was seconded and voted on, he motion didn't pass as City Council members Lorie Bragg and Ed Spriggs, who were both in favor of reducing the requirement to 25, voted against Patton's motion ending it in a 2 -2 vote. With that occurring it made little sense for any vote on changing the Special Event Permit requirements so for now everything will remain as is for the residents and businesses who have complained about the large number of special events and the city workers who have to prepare and clean-up after them but maybe just for a short time as the item will be revisited soon when more information is available. West and Patton wanted more information before making any decision. However, this may be resolved sooner rather than later as the item will be revisited and City Manager Andy Hall was asked to provide more information to the questions City Council Members had so they can make an informed decision as Mark West and Bobby Patton felt it didn't make sense to pass an item that ma or may not have any significant impact and need to ave more questions answered as they want to make one correct decision and not have to keep on making changes and experimenting to see what helps and what doesn't help the problem. The item will be revisited at the next City Council Meeting When All are present and hopefully when IB Mayor Dedina gets back something can be done about this problem. We will keep you informed as more information becomes available.